This is one of those tours where the homeowner didn’t contact me; her super-talented photographer friend did, describing Joanna Gaines’ home in Waco, Texas as kid-friendly and fabulous even with four little ones running around it all day and all night! The black, white, and sandy shades are softly stunning together, aren’t they? And I love how she has incorporated lots of open, clutter-free spaces for chasing games, and more than enough soft corners upon which to land. That’s really all a kid needs to have fun, don’t you think? Well, that…and a few chalkboards! Please enjoy the Gaines’ home tour. Q: Who’s lucky enough to live in this home? A: Me, my husband Chip, and my four sweet children: Drake (6), Ella Rose (5), Duke (3), and Emmie Kay (2). Q: You clearly have a talent for design and collecting distinctive pieces. Will you give us your back story? A: Well, I used to own a shop called Magnolia. I started it when we first got married and kept it for a few years. To be honest, I missed out on a lot of my oldest son’s first year because of the shop. So when I found out I was pregnant with my second child, I decided to shut down the shop and stay home with my kids. I still longed to do design because it serves as such an outlet for me. My husband and I have renovated homes together since we got married, so we decided to start Magnolia Homes. Chip manages the construction side, and I do all the design work. We love giving homes their stories back. Some of the homes we have done I could honestly say most people would have bulldozed! Our passion is to breathe new life into them. One thing was still missing, though; I missed my customers from the shop. So I decided to have Magnolia Home shows in my home three times a year. I set up four rooms in my house with one-of-a-kind finds and unique inventory I’ve gathered over the past year. At every show there will always be old architecture, great greenery, and unique pieces. Every now and then I come across a piece that I know I won’t ever find again and I keep it for myself! My kids are unbelievably great at not even noticing that the house has been turned upside-down. They leave it all alone. I have the show in my home on a Thursday; we clear everything out in one day, and I get a chance to catch up with the ladies who inspire me to do what I do. I love my job because whether it is remodeling or the home shows, I can do it all from home! Q: Tell us the history of your home. A: We recently moved into this new home we bought to flip as an investment property. This house was a foreclosure that had sat vacant for three years. I was actually upset with my husband for buying it because it was ugly. We renovated the house in three months and put it back on the market. We had a buyer for our present home and we had to find a new home in less than a week. And yes, you guessed it, we moved into the flip house. It was the only option. I love how sometimes a change must occur so that new perspective may come. I never realized until we moved that I had decorated my old house more like a museum full of “don’t touch” objects than a kid-friendly environment where my kids could be kids. As we were moving in the new home, I saw my kids running all around and it inspired me to make this their home. I love this home we are currently in. Not for the same reasons that typically draw my eye to a home, but because my kids love it. They thrive here, and honestly, that makes Mama happy! The house is so open, with so many spaces in which to run! It is one-story, so we are all on the same floor which makes the kids happy. 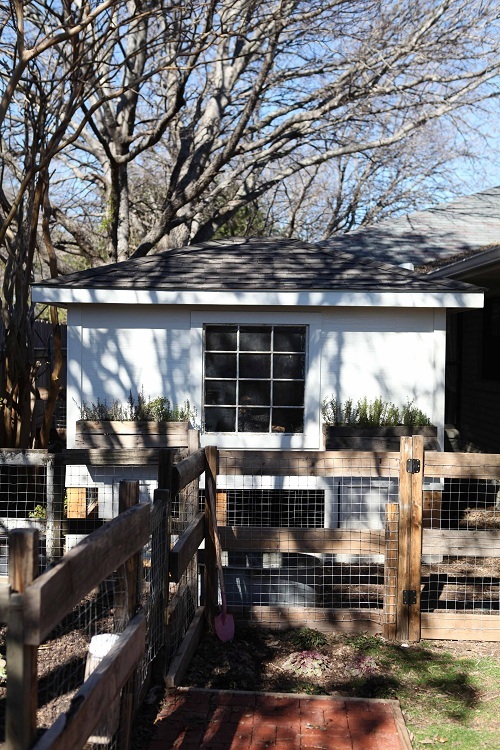 One of my favorite parts of this home is the side yard that has our garden, the chicken coop, and an outdoor space for my children. It’s like a little surprise when you step outside. Q: How would you describe your design and decorating aesthetic? Did this change when your kids entered the mix? A: I love clean and simple. I love white. I like to use different textures and dimensional items to add interest. 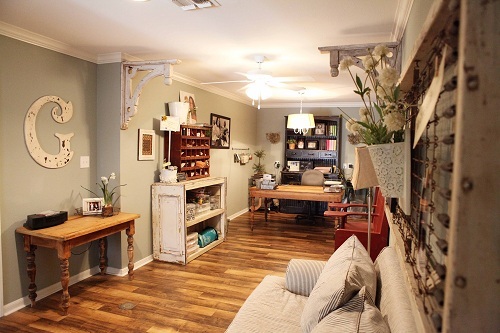 I believe that every house needs a good blend of old and new pieces. I typically don’t use expected things like draperies; I prefer to use outdoor awnings for my windows inside. I like to use architecture on walls. I love to inspire women to use common things in uncommon ways. 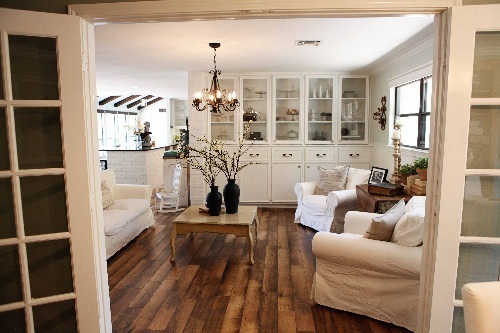 My dream house would be all-white furniture and painted white floors…but I have four kids! I have the white furniture but purchased the white IKEA sofas and chairs with slip-covers. The other day, my two-year old took a pen to one of my over-stuffed chairs, and marked all over it. I didn’t freak out because a new slipcover is $35. Yes, my design style has changed; kids added color to my life and to my home! In my last home, my kids adapted to my style. In this home, I’ve adapted to theirs. Q: Does your home always look the way it does in the photos? What would we see on an average afternoon after the kids get home from school? A: I had to get over the idea of perfect, clean, and dust-free. I noticed myself picking up after my kids the entire day. I was constantly cleaning so my house would look perfect and in order. I finally realized I was missing out on so many moments with the kids because I was concerned with something as irrelevant as clean counter-tops! I now make it a rule for myself to not waste my day cleaning because we all know it will get messy again. I can start clean up at 7 pm. I do like to go to bed and wake up with a clean house! Q: What’s your basic philosophy on living with kids? Is their mark apparent in every room, or are there some that are completely adult-oriented? A: My philosophy is to embrace where you are and the season you are in. 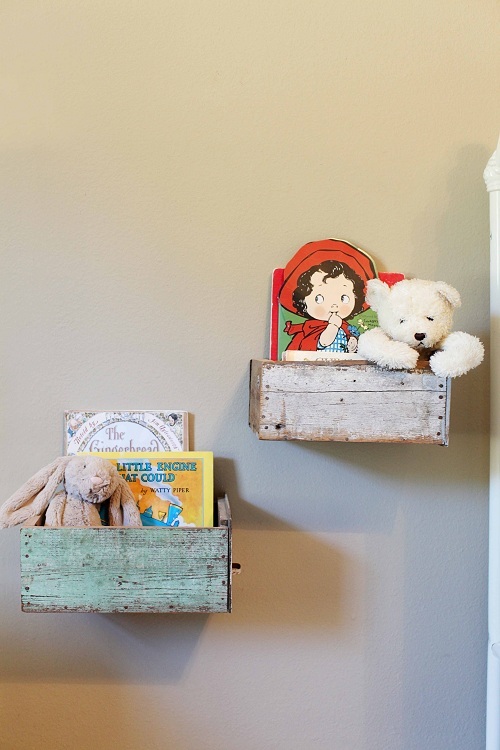 If you have children, create child-proof, inspiring spaces where they will thrive. It took this recent move to help me realize that I have to be intentional with whatever space I am given. Creating an environment of fun, creativity, and order does not just come naturally. I had to work at it and become a student of my children. I had to get into their minds and figure out what they loved and what inspired them. I had to make a choice to let go of some of the things I love as well as my expectations of what a pretty home should be. I have a small living and dining area that are adult-oriented, and then my bedroom. We do use the space in my room for wrestling matches, though! My kitchen is my room, and serves as my main workplace. It’s my favorite part of the house, but I still have baskets in the island full of toys so they can hang out with me when I cook. Q: You love chalkboards! What is it about them that make them such a fun design element? A: I have a mini obsession with chalkboards. I think chalkboards are great for children. We use our big chalkboard for homework time and for fun time as well, although Pictionary with a three-year old is an eternal guessing game! I encourage clients to paint a section on their wall with chalkboard paint and trim it out if they have the extra space. Kids love coloring on the walls, so why not let them? Chalkboards are also a great tool for personalizing your space; for instance, if there is a family verse or mission statement, a chalkboard is a great tool for this. You can almost always bet that fun junk stores and unique shops will have chalkboards. 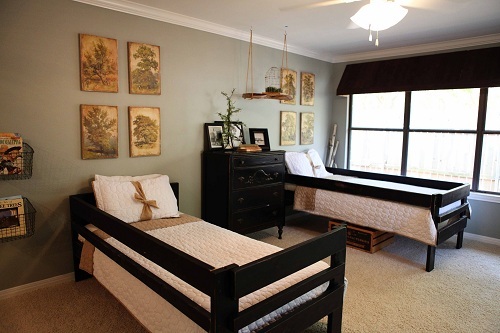 Q: Your kids’ rooms are delightful! 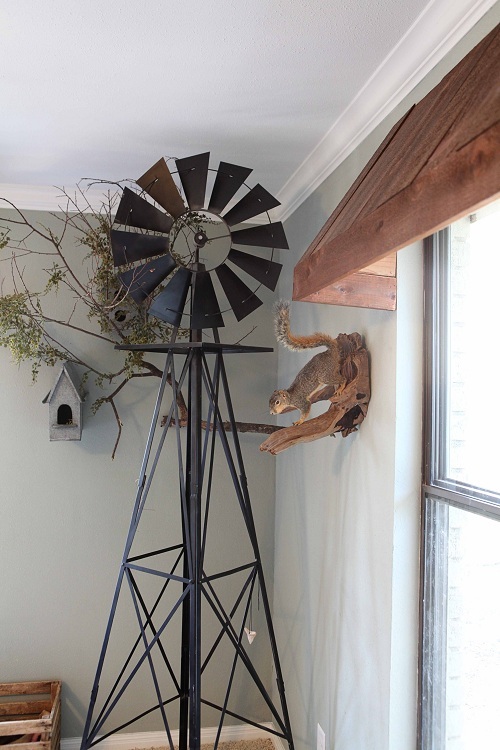 A windmill, a swing hanging from the ceiling holding a birdcage, decorative mantles…love it all! What are their favorite elements in their rooms? Q: How much influence do the kids and your husband have on the decor of the house? A: My husband is very creative, so he is part of the design process a lot of the time. He also is very helpful at hanging things that aren’t typical objects to hang, like a heavy iron gate and branches on our walls. My kids influence me to keep things simple, practical, and fun. Q: What if one of your kids came to you and requested a hot pink room with — gasp! — Littlest Pet Shop appliques on the wall? A: I always joke that for some reason, purple is my least favorite color, and I swear my girls are going to ask for a bright purple room one day! This one is hard for me because I really want my children to express who they are, but I also think they need direction since their likes and dislikes change so often as kids. I like for the design of our home to flow, so for the most part I design their room and then allow them the freedom to add to it. So far it has worked and my kids like what I come up with. Now, when they are teenagers and have an opinion, I am sure all this will change! As far as the appliques, I would have to say save them for the closet or behind the door, or limit it to a decorative board they can personalize that you can hang on their wall. Let them have what they like, but don’t let it be the entire theme of their room because we all know it will change in a month. I remember I loved kittens and cats one day, and the next week I was into sailboats. Q: What is your best advice for people building a house and decorating it within budget? A: Be creative and enjoy the hunt. Use antique light fixtures you can get for $30 at a junk store. Also, so many major stores like Lowes have great products at very affordable pricing. There are also a lot of sources on the internet that copy certain styles from big names but at discounted pricing. One thing I always like to keep in mind is adding character to your home, even in the building process. Old architecture, corbels, and old doors are always fun to incorporate in a new home. Just remember to use quality where it counts like kitchens and bathrooms, or you will pay later! Q: When does your home work best? A: This home is great for entertaining because of its open space, but also great for lots of kids because of the large bedrooms and play rooms. There isn’t any wasted space, and this house is very functional and practical for our needs. It is a great house for living, and I really love our home most for this reason. In this season of our life with four fun kiddos, it fits us perfectly! One more thing! I like to encourage women to always remember that their home is a reflection of their hearts and of their families, not a magazine or like someone else’s lifestyle. Keep it true to who you are. It’s important you love your home and that your children are inspired by it. I learned in our recent move that it’s not about the curb appeal or amenities…it’s about the spaces you create and who you create them for. Have fun with it, and go draw on the walls with your kids! I can honestly say that I’ve never seen a windmill used inside as decor, but it makes me happy to know that some lucky kids are waking up to one every morning! Thank you, Joanna Gaines, for sharing your style with us. P.S. — Find Chip & Joanna’s book here. And hey, if you’d like to share your home with us in my Living With Kids series, drop me a note. Maybe HGTV will discover you next! What a beautiful space! I love the hardwood floors – practical with kids and stylish too. Just the perfect mix of new and old with some whimsy. It looks like a space that a family really lives in rather than a show home. Well done! What an inspiring way to start my day! So gorgeous! I love the color scheme and clean lines! Thank you, Design Mom! The “Living with Kids” series is great! GORGEOUS! I love the flow, I love the colors, I love the tables, I love it all! She has amazing talent. You can see that is a house that is lived in – how I wish I lived in it! I’m loving this series, so many beautiful homes! I love the unique objects and amazing floors! But honestly this house makes me ache for color; especially in the kids rooms! Thanks for a wonderful blog. I just discovered it and I’m loving every word and every photo. Also, as I’m about to move into a new house with my family, I’m finding so much inspiration to take the time and make it work and make it beautiful for all of us. Wow! Do you know when you look at a place and fall in love right the way? Where you wouldn’t change a thing? This is it! I love how natural, earthy and family friend this home is. Gorgeous! Thanks for sharing it, Gabrielle. Wow, she is one talented, smart, but down to earth lady. Thanks for sharing! This was a great post! We’re about have a little addition to the family making it 4 kiddos under the age of 6 and are in the process of buying a house. Joanna had A LOT of kid-friendly tips and ideas that I found so inspiring! Totally cool and fabulously adorable! What a gorgeous home – and so warm, too. Love it! So beautiful! My home is full of neutrals, and I thought I was getting myself into trouble, but I now see that if it’s done right, it’s OK. Our bedroom is the exact color of the master here. It’s still a work in progress, but I’m glad to know that I don’t necessarily have to add color because I didn’t like the way color looked. I looove the black and white accents so so much. Thanks for the post! I love this home – what tremendous style she has! I can’t say enough about her use of chandeliers in almost every room – spectacular and down to earth, all at the same time! I am in love! I love the mini boxed wall units filled with books and lovies. I am obsessed with chalkboards too! Thank you for sharing your beautiful home. Hi! the floors are actually a LAMINATE made to look like distressed hardwoods!! Everyone asks about them when they come over and are surprised when they find out they arent hardwoods. They are very affordable! I have had many diff types of hard woods in my homes and this “look a like” has been my favorite now that i have kids the are the best option. Easy to clean and almost impossible to scratch! We have the wood laminate in our warehouse. If you are interested we can ship to you but you have to find someone to install it. thank you so much for the reply.. I finally just saw this. I am still house hunting right now (actually I’m about to put a bid on a fixer upper- fingers crossed). I will keep you guys in mind for sure. I’ve installed laminate floors before, but I’m hesitant to do it again because my dog HATES it…. it’s just way too slippery for her. I’m thinking maybe the vinyl plank that looks like wood, some are even textured. have you had any experience with that flooring? I am interested in these laminate floors that look like hardwood. I’m so over carpet in any space because I have four children under 5. :) this kid friendly but pretty flooring caught my attention. Where can I get more information? I have googled but haven’t found anything. Thanks! You have a beautiful home!! I would love to know more about the laminate floors as well, we are in the process of picking some for our second floor. Thank you! I just saw this post and wondered if you could tell me the brand of this laminate? I love it! 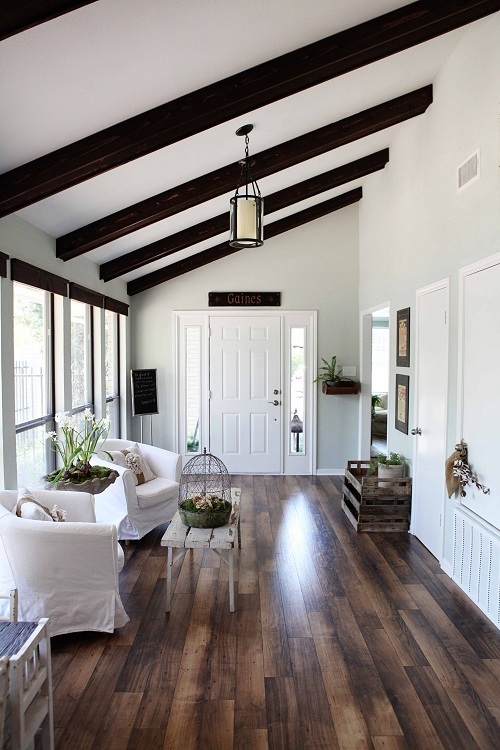 I would love to know where I could get these laminate floors! I am so inspired by this home. I want to redecorate my own house right now! I´m in love with this house…so adorable. Great ideas! Beautiful home. Thank you for sharing! Love the color of the walls in the dining room and the room with the windmill. Can anyone name the paint color? I have been forever searching for the perfect gray/green/blue. 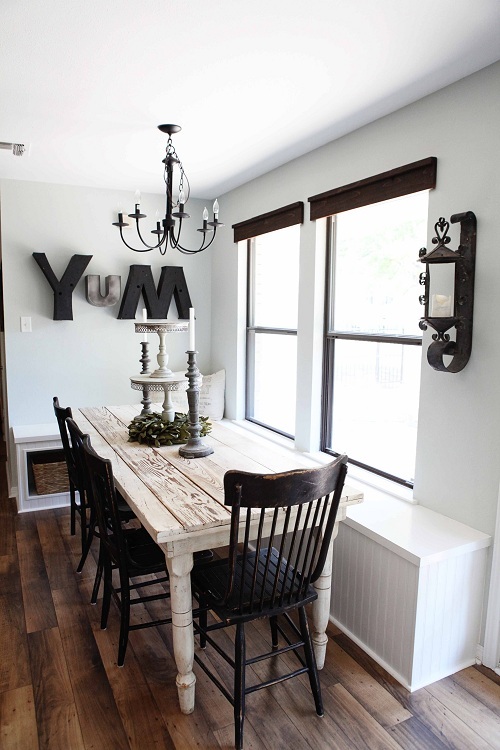 the paint colors in the dining and room with windmill are Sherwin WIlliams Oyster Bay!! Great color! This home is truly inspiring, I love the color scheme and that every room has it’s own unique character without taking away from the overall flow of the space! And those hardwood floors are to die for! I really adore this home. So many stunning, beautiful and creative touches. So many ideas. Wow! This is my dream home! I am amazed at how nicely the old and new come together, the colors and the lovely light. Thank you for sharing! This is my favorite house tour you have posted about. Thanks for sharing. Such a gorgeous home and so thoughtfully put together. I love the mixture of whites, blacks, neutrals and woods. It looks like such a happy place for kids and adults alike! Also- the paint colors in the dining and room with windmill are Sherwin WIlliams Oyster Bay!! Great color! How much per sq ft is the laminate? The floors are amazing! I love her mix of Ikea with it all. This series makes my day! I can’t believe those are laminate floors. What a beautiful home! And in Waco?! I lived right down the road from Waco for 10 years. As a mom of two young boys, I struggle with making my house look nice but also kid friendly/a place where my children want to be. Just today at Bible study, we were encouraged to not get caught up in the “my house/every area of my life has to be perfect” and just enjoy the time we have with our children. (Who cares if it takes an extra 15 minutes to put the dishes away when they’re helping–they love it!) So reading this post was another timely reminder–thank you! It’s a lovely house, very calming, soothing and has a unique personality as well. my husband and i sell them to local shops around town. When business move or go out of business, we get the signs down and spell fun words with them. we have come across some great letters! I like “G”, “N” and “Z”. Oh yeah, “T” is awesome! My daughter would like to know what color you used in the girls room as she is switching bedrooms and is inspired by your decorating. 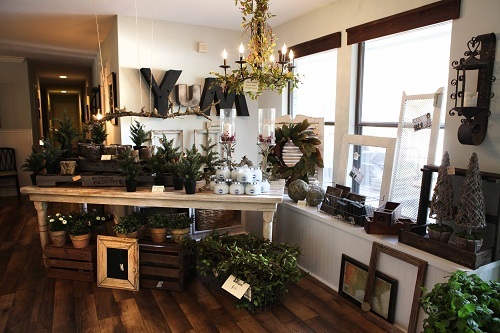 What is the paint color on the wall with the “Yum” sign. Is that oyster bay too? It seems lighter. Thx!! I love going to my sister’s home as these pictures express her home filled with effervescent life. However, to go there in person is an experience in which I must express, I never want to leave! Of course I live in Austin, but getting to come see her and Chip and my nieces and nephews is like being in a scene of one the warmest movies you could watch over and over again. Joanna truly knows how to express her love for her family even through the way she designs and decorates! I’m proud to call you my sister Jojo!!! 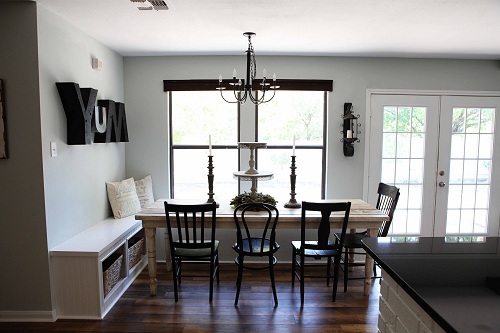 I love designmom’s website…so awesome!!! Hi! I love love your house! The color scheme is so serene and homey. And the collection of furniture is truly inspiring. 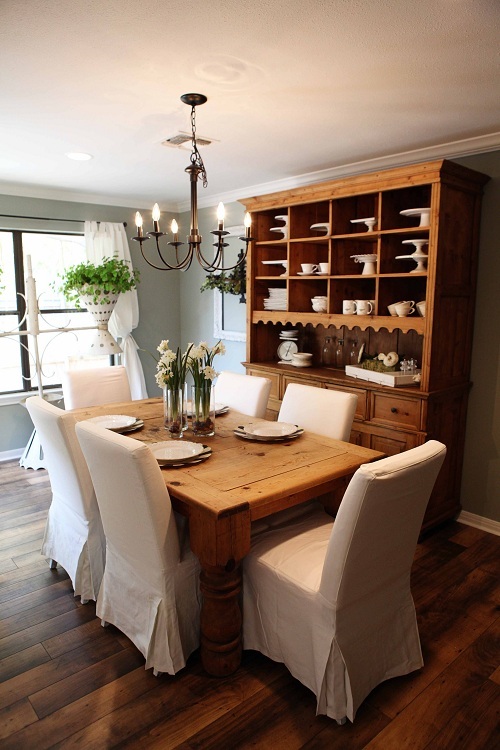 Where did you find your gorgeous honey colored farm table dining room table? Beautiful home! You have inspired me to change things up in my home. for sharing your home. Love all of the chalkboards too! Your home is breathtaking! 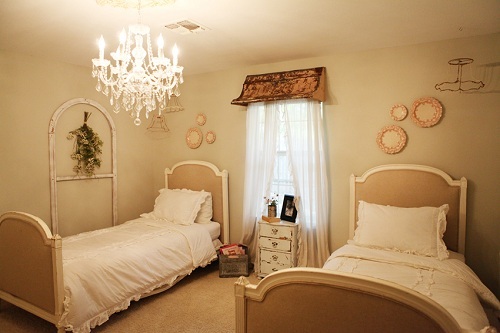 Can I ask where you purchased the chandelier in the photo of the bedroom with two beds in it? It’s exactly what I would like for my bedroom that is being redone at the moment! Thank you for the post, it inspired me! 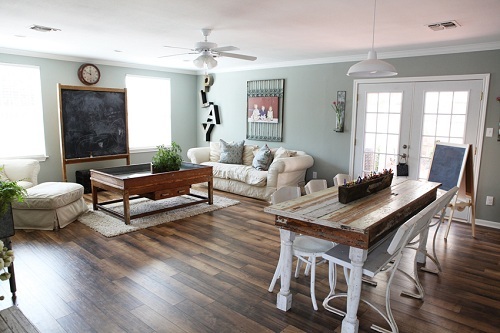 that large chalkboard and the tree stumps as chairs – so great! Your home is so lovely. Although your style is more neutral than my own, I feel it is easily adaptable to color. I pinned your room with the dark beams a while ago, but I keep coming back to your page to gather more & more ideas! I think it’s great that you do your Magnolia in-home events! I wish I could come, but I live in Hawaii. 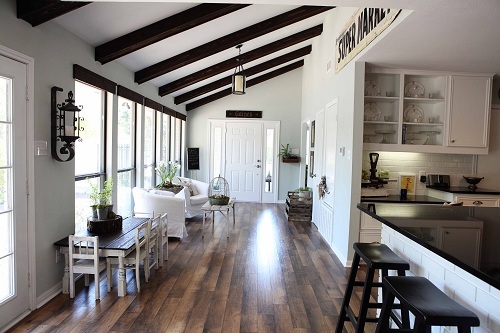 I recently moved into an older home with beams & am trying to make it clean, spiffy & stylish. Old homes are new to me. I admire your work. I must say i have found my dream living space. What a lovely home. I live in an old railway house in south africa with loads of potential just waiting for them to sell it to us. My Heart will soar when i can start making this old house a loving home for my family. All I can say is WOW what an inpiration. Hi! i found your blog through pinterest. I love the artwork from your site that has been pinned called Rainbowimageanthology.jpg. I really want to know the name of the artist. Do you know that or even the name of the designer who did the room? Any help would be appreciated. Thanks! I know I’m getting to this post a little late, but just had to say how much I enjoyed this space. So bright, so much character, and cozy to boot! I love it. 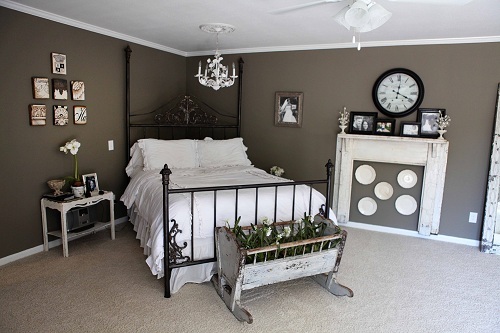 What a lovely home…can you tell me where the iron/metal bed in the master bedroom came from? I’ve been looking for one for many years and this is the first one that really catches my eye! Thanks! 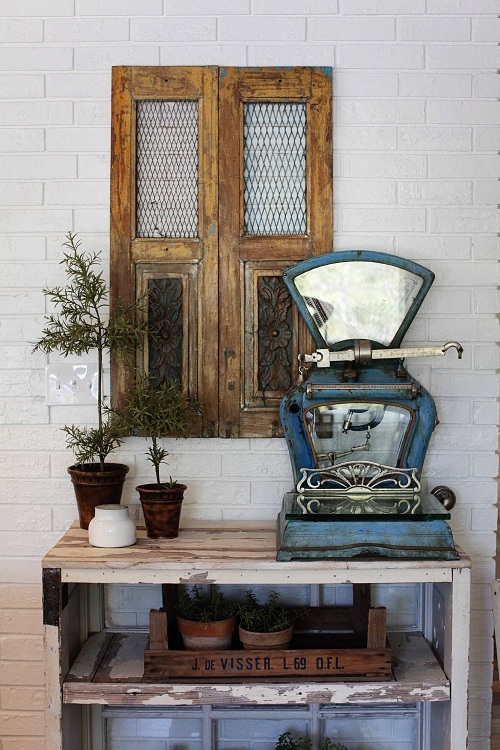 I have a question for everyone that has kids and used “shabby chick” type decorating with old windows, worn paint etc. Do you consider that this paint is likely to contain lead? I wonder because our daughter had elevated lead in her blood so we had to get rid of furniture with old paint. Do you test it first before bringing it into the house or sandpaper new paint to give it an old look? I really love that floor. We have been floor shopping for a while and I just love this one! Where can I buy it?? I love your home! So beautiful and inviting. What did you use to do the wood floors? I watch and enjoy it your t.v. show “Fixer Upper”. I really like your style. I love your all pictures and that’s what exactly on my mind to have these if I’m rich, lol. I have a question for you. What is your nationality? Are you an American natives or what? You look like cross between American Natives: Eskimo and/or Indian. You have a beautiful face. Olive skin and very nice complexion. Please email me at LDomane@hotmail.com. I’m deaf. I appreciate it! Have a wonderful holidays! im dying to know too!!!! post for all of us to see!!! Her mother is Korean and father is American. What exactly is American? What a peculiar answer! Would you and your team concerning working in houston? I absolutely love your style! On one of the ‘Fixer Upper’ episodes, there was a wooden white sign that said “let what you have done today be enough…” Where could I purchase that sign? Thanks! Totally agree with every thing Lynette said. My hubby and I just started watching the show and found it refreshing, uplifting and inspirational! I love how you include your children as well. I hope to watch many more episodes for years to come. I would love to see a photo of the light fixtures over the kitchen counter. I saw them in the background on one of the episodes and I assumed it was the Gaines kitchen. They are silver and have an industrial/barn look to them. Hoping I can find something similar for my home. fan of HGTV for years. Your show is a great addition! Huge fan of your show and designs! I want you to come to california and do my house! My question is how do you get your paint to look “airy” and “light.” My colors always come out very solid and dark despite plenty of natural sunlight. Do you use less color pigmentation when they mix it? I love your show . Where did you find the tin wash board you put in the house you put three on the wall?? I love watching “my favorite new show”. Keep the shows coming….they are full of eye candy. Hi Joanne-you have a beautiful house and family. I love your style if decorating. It is my dream to begin a begin a business similar to y’all’s. Maybe one day! I was curious as to when you started having kids? Joanna, what is your nationality? Gorgeous home!! 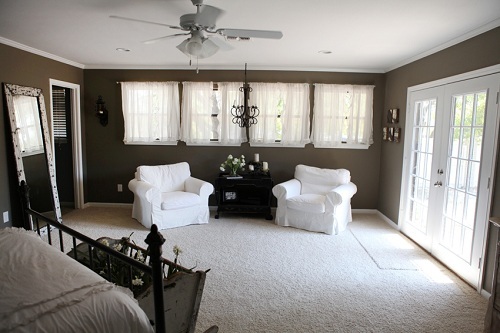 Can you tell me the name of the paint color in the master bedroom? Love your show with your sweet family. Please tell me how to order the laminate floors in your house from you. I’m building a house and love them! I love the color in your bedroom. As a matter of fact, I live in West Virginia and my new dream is to move to Waco to have you and Chip decorate a house for me. It’s all I can think about!!! I have logged into a realtor site who updates me on available properties and after I look at the pictures of the inside, I sit and imagine all that you and Chip could do with the place. Oh well….like I said…it’s a dream. I could honestly turn my whole house over to you to decorate and I would love every single inch of it when you were done. I love every part of your decorating style and watch your show every week. I guess you could say I’m ADDICTED!!! What is the breed of the two adorable puppies you just got? Hi there Joanna, I read one of your posts where you stated that you would sell some of the wood laminate flooring you have installed in your home. Is that the flooring in the main entry way? If so do you have any left and what is the price per square foot? Thank you and my husband Joe and I really do enjoy your show immensely. Thank you for bringing a smile to us when it is really needed. So happy to find this article! Watching this beautiful family on HGTV has been entertainingly fun, makes me smile big and warms my heart! Hip Hip Hooray for Chip and Joanna Gaines! Can’t wait for season 2 of Fixer Upper! Please have someone email me with details of the laminate you used in the farmhouse. 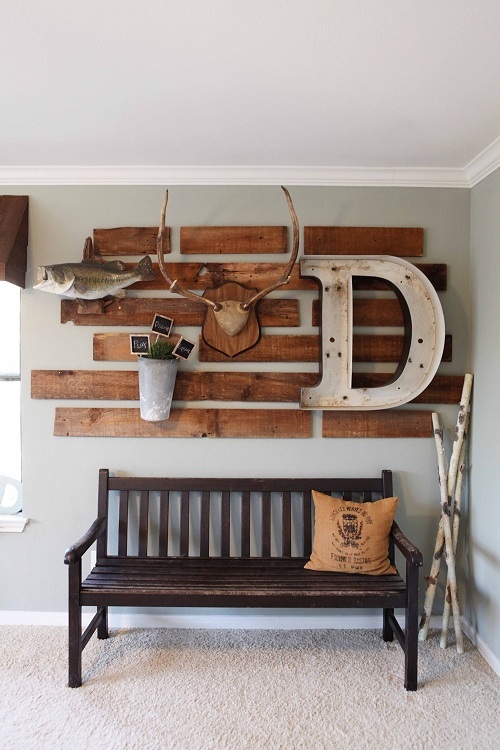 Stephanie.templet@yahoo.com I love everything about your farmhouse, your show and your precious family!!!!! Everything is so bright and positive! Bless you! You are a breath of fresh air! Your decorating intuition is inspiring. I saw someone ask what makeup you wear, I’m going to ask where do you buy your clothes, and boots? Love your style! Hope to hear from you. Thanks! Your personal style is as wonderful as your decorating style. Please share with us your favorite stores/brands for your clothes – I love the tops you wear on the show but have not been able to find them anywhere. I also love your show and style! Would also be interested in the laminate flooring and how to order decor from your store. Thanks. May God bless your family. Joanna, I love your designs !!!! And I love your clothes where do you buy your clothes? and I love your animals and watching the kids in the garden. Look forward to those moments during the show when you are all back home on the farm. Sweetest show on HGTV! Hello, I Love your design technique! Your family is absolutely beautiful! I love the show and your style. I have been inspired to update our living room from a very “old world” style to a much more light and airy rustic style. Could you please tell me where you purchase the slip covered sofas from? I have been trying to find where the gorgeous yellow dress you wore along with cowboy boots on a past episode is from. It looked knit , had fabulous detailing, and was the most perfect shade along with a romantic vintage feel. Obsessed! Ditto! I can’t find it or even a picture anywhere. Can you!? And as always you two deliver great giggles with your humore. Thank you so much for sharing with us more then just how to build and remodel, but make me for one feel as if I am in your home to just chat. Take care and PS enjoyed seeing all the animals on your farm. What a lovely home! I love all the furniture’s and decorations you have in your house, as in all of them. All of the materials are perfectly matched and really give lots of statement. Not to mention, that this kind of design is a kid friendly. You are a truly talented mom and wife. I truly love your HGTV show. It’s so nice to see a married couple working hand in hand. I have never heard the first 4 letter word from either of you and that IS VERY REFRESHING! You can see the love that the two of you have for each other! By far the best HGTV show! I’d love to have you decorate my house and make it a home! Saturday, I watched my first of your shows on HGTV and to my surprise it showed you and your children with the crayon box that my daughter sent me a picture of last month. She said she’d love this for her boys. I’ve searched Online for more pictures of it but I’m not having any luck. I thought I might find it in your Magnolia shop but didn’t find it. Can you provide me with other pictures and dimensions and perhaps my husband can construct it. Where can I find the blue curtains u used in the “single mom” episode? I am searching for a buffet/hutch like yours. It’s beautiful. Do the know the maker? I found this show while sitting in the hospital with my husband after he had a stroke in July, I was overwhelmed and felt like nothing was possible anymore. I think it was about 2am and I turned on your new sweet show and a hopefulness came over me. No matter how rough things can be ,” you can make them pretty again” (as your baby said from the car seat in the back of the van) in one show. I still feel quite defeated most days and now everything about my house needs changing but I also know one day it can be done. God bless you for all the joy you bring and the hopefulness! Also love the way you love eachother!!! My whole family looks forward to your show! We miss it right now! It does not seem to be on? where did you get the entry way bench? J: You are an inspiration as a mom and a designer/wife/person, all! Thanks for sharing your family and yourself with the world. I live in the midwest and love what you’ve done in Waco. God bless your world. Can’t wait to see more from you and Chip and family. I love your show and everything that you decorate with. You have eye for things and make a home homey and sooooooooo beautiful. I like to know something next year I planning to retire and live in Florida are you willing to help me find a fixer upper and decorate the home? I’ve inherited a home in Puerto Rico and decided not live there and so the house is for sale now when sold I will be able to buy in full for my home in Florida, but I love you to decorate it and fix it can you? Please write back if your willing to do this? I am serious about doing this. Just found your show recently and went back to watch all of the episodes. I love your decorating style and all the houses. Love your blog and store website. Hope I can go to Texas sometime and visit your store. Like that you give the details and paint colors. I hope it continues many more seasons. Oh my GAWD love your show. There will never be another amazing, graceful, witty, humorous, juggling mind mastering program like it …period. People love to see the true passion connection from your persona’s to their hearts. You both know exactly and precisely who you are together. I would think alot of viewers are so happy for you., and also …that you’ve been blessed to have Chip! A Great Man too! Keeping my fingers crossed to come to do a makeover at our house! Love your show and the relationship within your family. I wish there was more wholesome models of godly home life out there. Blessings to you! Keep up the great work and beautiful designs. I appreciate that you do not yank out all the beautiful wood cabinets and rustic features of a home. Kudos to you. 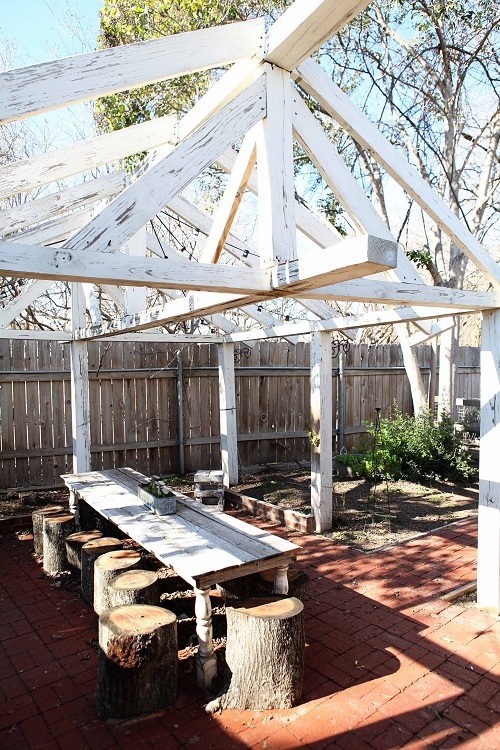 I absolutely love the work you and your husband do on homes that otherwise might be torn down. I can honestly say I have yet to see one you both did that I didn’t love. I also love laughing when Chip cuts up. I wish you were here to help me decide on a few design strategies for my home because I so completely trust your sense of style. Thank you both for the beautiful work you do. Joanna what is your nationality. You are lovely and I think maybe part Native American? Hello Joanna! I am one of your biggest fans. I love your show and it has inspired me in many ways. The one thing that is most inspirational is the way you and your husband Chip treat each other. To laugh and tease each other the way you both do is an eye opener. My husband and I use to be happy like that together, but after 21 years we have forgotten to love each other in that way. I guess you can say raising children has been our priority. So thank you for reminding me to take the time to laugh and play and enjoy my husband! P.S. Could you please tell me the name of your laminate wood floors and where I can purchase them? Thank you so much! Good luck with your show!